WHATCOM COUNTY, Washington: VOTING AND VOTE-COUNTING, with INTEGRITY! VOTING AND VOTE-COUNTING, with INTEGRITY! Whatcom County in Washington State has a vote counting system that meets a strongly procedural, high integrity standard of checks and balances. We have official "Observers", usually representing the political parties and other distinct interest groups like the LWV, but any person may take a brief training by the Elections staff, sign an oath of how to do the task, and thus be permitted to "Observe". These observers are allowed to be in the rooms where any of the ballot and vote management activities are taking place. They may not touch any materials, and may speak only to a Supervisor to ask questions, or for designated activities. 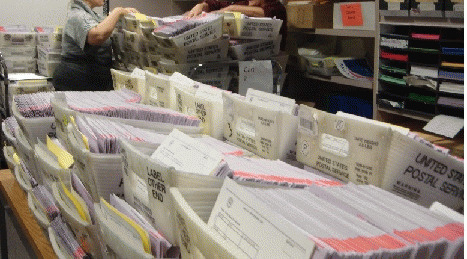 The general sequential process is as follows: The ballots are mailed to the voters. A person votes their paper ballot by marking an inked line in the read-area for their intended votes, puts it into the secrecy envelope, and puts the secrecy envelope (containing the ballot) into a slightly larger outer envelope. On the back flap of the outer envelope the voter signs his or her name. The voter then either mails-in the ballot or deposits it in a drop-box at one of the locations established and advertised by the Auditor's office. The envelopes containing the ballots are gathered regularly by two staffers from the Auditor's office, from the distributed official drop-boxes and the US Post Office. In the office, they are placed into random batches of about a hundred ballots, each batch put into a large plastic tray. Each tray has a unique "ID"-number and is thus identified on a log-sheet created for each batch. The trays and ballots are then stored in a safe. The Auditor's office has a copy of each voters' signature in their database system. Before the ballots are removed from their return-envelopes, they are processed by persons trained to compare the signature on the (still-sealed) outer envelope against the signature on record. For the purposes of this discussion of integrity, we thus know that the signature has been visually verified, thus the ballot is declared to be from a registered voter, and this is registered in the database. Thus, only one ballot from that voter will be processed. In order to have the ballots processed, they need to be removed from the outer and the secrecy envelopes, and they are separated. At this point the ballot cannot be identified as to the voter who cast it. Then, every ballot is visually inspected and reviewed by staffers, to pre-determine that voter-intent will be read correctly by the scanners. Any marks except a proper vote, usually requires that the ballot be manually duplicated by staff (always two people -- one marking, the other checking.) Log-sheets are kept and signed by both, and the voter-marked ballots are moved to a different storage place -- and both of the log-sheets are numbered for cross-referencing, so that at any later time, the voter-marked ballots may be retrieved for verification. The Washington State law requires that effort must be made to count the vote according to the "voter intent", and there are 24 different "voter intent" scenarios which are recognized as guides for the staff. So, there is an initial visual inspection of every ballot. Where irregular marks are seen, the ballot is duplicated following that guide. In instances where a voter's intent cannot be determined, a duplicate ballot is made, leaving out that item. The same will happen if the computer-scanner spots an irregularity -- the ballot is removed and a duplicate made and re-inserted in the process. Other safeguards include:-- ballots (and their digital twins) are handled and stored in "batches", arbitrary bunches of usually about 100 ballots placed and managed together. Several batches may be placed in a storage box. Each batch and box is identified by a unique number, and all the activities for managing the ballots are registered in a logging-system. If some ballots get withdrawn from a batch for some kind of verification -- they get re-registered in a new batch, and the record of the batch they were taken from gets edited to show the lower count. All these movements are checked by staff and a supervisor, and signed by them both. The boxed batches are kept in a secured room except when being processed.